Kenny Jackett knows Pompey need a sprint finish to book their place in the Championship next season. After being five points clear at the summit of League One on New Year’s Day, the Blues’ dip in form has left them with a battle on their hands to be promoted automatically. Saturday’s draw at Plymouth not only meant Jackett’s side’s winless streak in the league stretched to five games, it also ensured they slipped further behind the two top. With 15 games remaining, there’s going to be little margin for error as Pompey try to clinch the magic 90 points generally required to go up. A barnstorming business end of the campaign is needed. Noel Hunt is confident the Blues are capable of earning promotion. He knows better than most that it’s more than possible – as he was in the same situation two years ago. Pompey picked up a 1-1 draw at Barnet. If it wasn’t for Conor Chaplin’s late wonder strike, the Blues would have returned to the south coast empty-handed. The result left Cook’s fifth-placed side sitting six points outside the automatic promotion places. After heartbreak at Plymouth the previous campaign, supporters were again preparing for another play-off rollercoaster. It wasn’t to be, however. Instead, Pompey would string together a remarkable run that would culminate in them being crowned champions on the final day of the season. From their final 15 games, Cook’s men accumulated 35 points from a possible 45. They registered 11 victories, two draws and two defeats – a run which would see them pip Plymouth and Doncaster to the silverware. 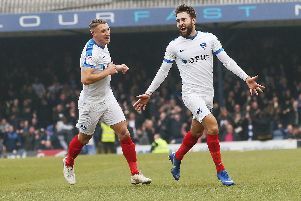 After their stalemate at Barnet, Pompey produced the perfect response by putting promotion rivals Carlisle to the sword with a 3-0 success at Brunton Park. A 1-1 home draw to Morecambe followed, before that abject 1-0 loss to Crewe cast further doubt if the Blues would ever escape the Football League’s bottom tier. The defeat to Alexandra prompted Michael Doyle’s memorable training ground battle cry, however. Pompey would win nine of the their remaining 11 games and even a 3-0 loss at Stevenage couldn’t stop the belief among supporters. The Blues escaped League Two with three games remaining, following the famous 3-1 win at Notts County. And they would end the season as champions, after routing Cheltenham 6-1 on the last day. So a quick turnaround in form is needed by Jackett’s side as they aim to rediscover their rampant form they displayed during the first half of the year. And Fratton history underlines automatic promotion is more than achievable.